I love this time of year! I love buying fresh corn, peaches, pears, plums, and apples. Does it get any better? Last week, I got a great deal on corn and bought enough to freeze. If I had known it was so simple, I would have bought a lot more! Seriously, I was done in less than an hour and wondering why I only bought 24 ears. In order to freeze most veggies, they need a quick blanching (to stop the enzymatic activity that causes decay) and a cold water bath (to stop the cooking). Read on to find out how to do this for corn. Fill a large stock pot with enough water to cover four ears of corn, and bring it to a rapid boil. While corn is blanching, fill a large bowl (or your clean kitchen sink) with water and ice. Quickly remove corn and plunge it into the cold water bath for 4-6 minutes. The cold water bath time and the blanching time should be the same. Continue with the rest of the corn. You will need to add new ice for every batch of hot corn. 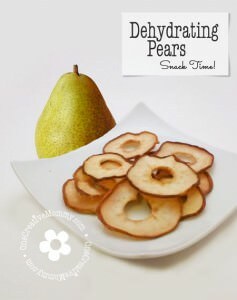 If you’d like, gently break the separated kernels apart with a spoon. My kiddos love it when the kernels are stuck together, so I don’t separate them. 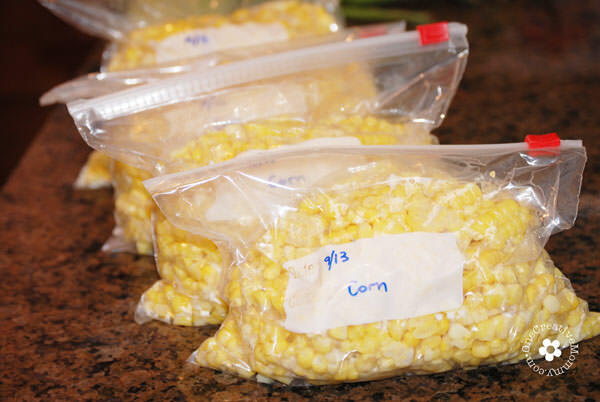 Scoop the kernels into freezer bags and squeeze out as much air as possible before sealing. If you are lucky enough to have a Food Saver (see below), this is a perfect use for it. I loved mine, but it broke years ago, and I haven’t replaced it yet. I got four large bags of corn from 18 ears. (I kept some to eat fresh.) I figure there is enough in each bag to very generously feed five people. Can you see why I wished I had bought more? Now that I know how, I’m ready for the next great sale. I’m so glad you stopped in for a visit! If you like what you see, please like, pin, tweet, +1, or share in some way! 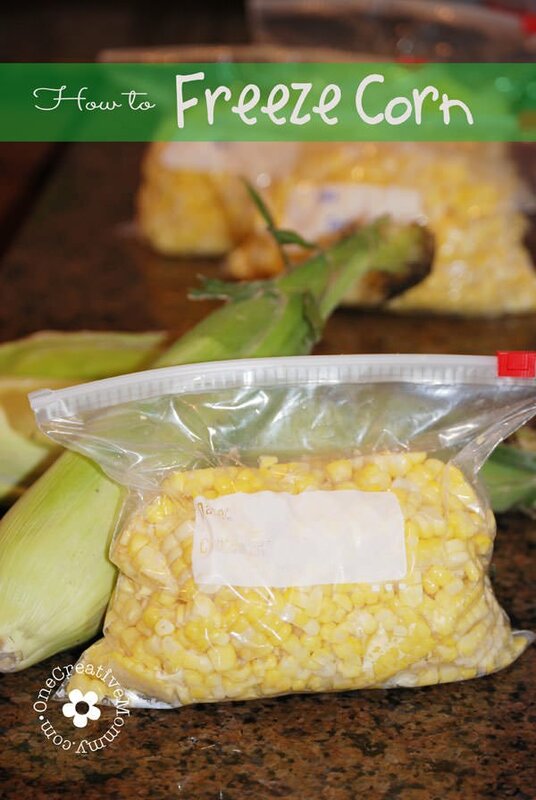 I love this idea on how to freeze the corn from the cob. Which is very delicious, by the way! This is the perfect timing trying to preserve the corn. Yum! 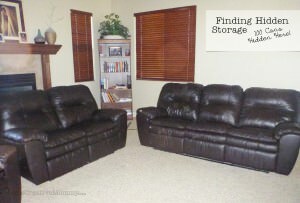 Thanks for sharing the tutorial, Heidi! Thanks so much, Gloria! We just ate some of it tonight! Yum. I’m off to check out your site. Do you have to remove the corn from the cob? I buy corn on the cob during the winter in th freezer dept. and I was wondering if I coud do that here? Thank you for your time. Yes, Trish, you can freeze the corn on the cob. I have never done it, though, so I’m not sure about the boiling time. I believe that all the steps would be the same, except you would not remove the corn from the cob. You would still do the blanching and cooling step, but I can’t tell you how long those steps should last. Here’s a post I found on google. : http://www.pickyourown.org/freezingcornonthecob.htm. Good luck! Another thing that could be done is adding seasonings and/or butter to the bags before freezing, then it’s just grab and cook! Great idea! Thanks, and I just have to say . . . I love your screen name! It totally made me laugh. This is a great idea. Corn is one of the vegetables my son will actually eat so finding a way to save it is helpful. I”ll have to give it a try. Just thought I would give you a tip for removing the corn from the cob a bit quicker. My grandma always removed her corn from the cob by using an electric knife. Saves lots of time!! We hardly ever leave the corn on the cob anymore since this is so quick for removing it, its easy to fix it for supper with plenty of butter and salt and pepper in a casserole bowl after cooking the ears in the stock pot. 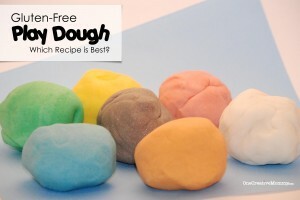 Simple directions and easy to make.